64-Bit Code. 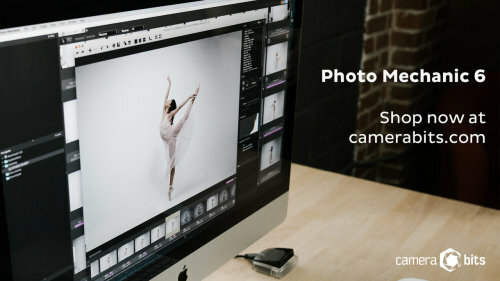 Now a 64-bit application, Photo Mechanic features improved caching. Faster Viewing. Thumbnail/preview generation speed has increased by approximately two to three times. Ingest From Selection. Copy only the images you need from your memory card to your hard drive. Streamlined UI. The improved interface is more efficient and less distracting. Better Fullscreen. Fullscreen is supported on macOS and Windows for both the Contact Sheet and Preview windows. Reverse Geocoding. If your photos are geotagged, Photo Mechanic will use those GPS coordinates to insert the city, state, and country names into your metadata. Better Crop Tool. A new grid helps you crop to your best composition, then press P to preview a crop quickly. Better Slide Shows. Multiple transitions include crossfade and add Tag, Color Class or Star Ratings during a Slide Show. The complete list of changes plus download links for v6 is available on the Camera Bits site. System requirements are macOS 10.10.5 to 10.14.x or Windows 7, Windows 8, Windows 10. Log into your account to check for an upgrade from prior versions. A new licenses is $139. For more information vist the Camera Bits Web site.